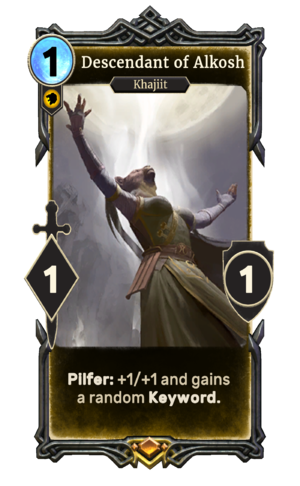 Pilfer: +1/+1 and gains a random Keyword. Descendant of Alkosh is a legendary Willpower creature card. It is part of the Core Set. "The moons give this one strength." "This one is destined for greatness." "I am too sleek for you!" "Do not ignore Khajiit's warning." This card's pilfer ability applies the Favor of Alkosh card effect. This page was last modified on 15 February 2019, at 11:56.